Mondo Fruitcake: Fruitcake tasting 2017! The annual fruitcake tasting was held earlier this holiday season. As you may have read, on the blog or on Facebook, a group of us make different fruitcake recipes and share them. We agreed this year that our fruitcake-making abilities have definitely improved from when we first began. It's hard to make a good fruitcake! There's the purchasing--who's a good purveyor of quality fruit, etc? Then the preparation: carving out enough time and doing enough planning to have your fruit soaking in alcohol, and making sure you have ALL the ingredients in time to bake. Because we have our party right after Thanksgiving, that means that we're purchasing ingredients and baking right after Halloween--when, face it, most people are not in the holiday baking mood. 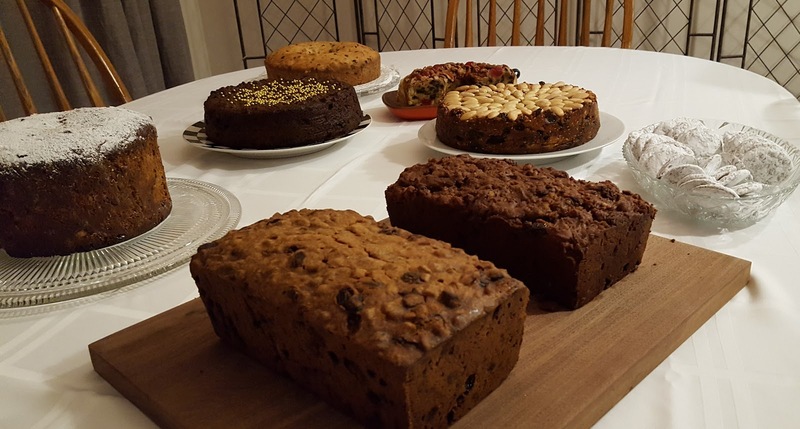 But several years of practice have honed this group's skills, and the photo below is the result-- a stellar group of delicious fruitcakes, cookies, and even a panettone! What you're looking at, clockwise from upper left, is a panettone, Nigella Lawson's Chocolate Fruitcake, Martha Washington's great cake, a half of Jane Parker fruitcake (the only commercially made cake in the bunch), Nigella Lawson's Gorgeously Golden Dundee cake, the Joy of Cooking's Pfeffernuesse (the powdered-sugar covered cookies), a chocolate fruitcake, and an 1866 (or Lee, as in Robert E) fruitcake. Unfortunately I don't have the last 2 fruitcake recipes in a linkable format yet, stay tuned. 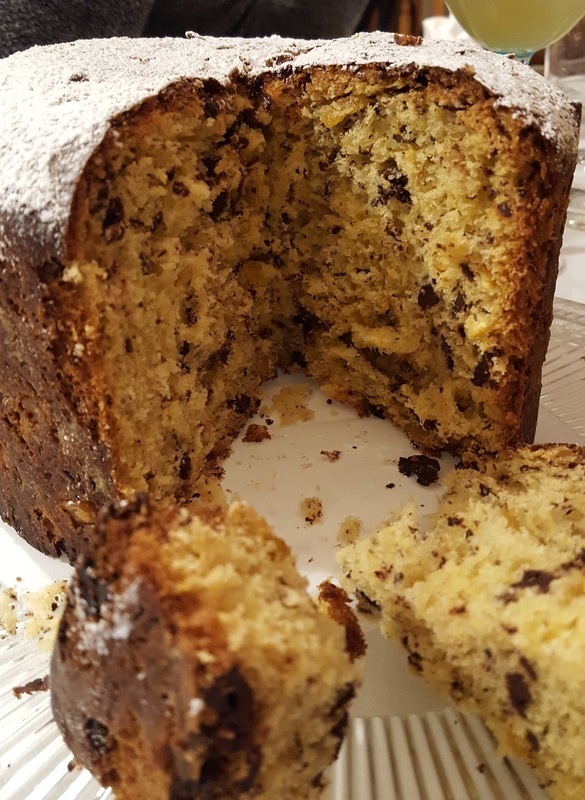 This group has had the Nigella Chocolate Fruitcake once before--a dense, dark fruitcake. I personally don't get a strong chocolate flavor from it; the other chocolate fruitcake tasted more chocolatey. Still, it's a good one to make if you like those dark, caramelized, deep and rich flavors in your fruitcake. My friend who made the panettone was not super happy with the result, but I thought it was delicious! A close up of the texture is at right.Some commercially made panettones are cloyingly sweet, but this was delicious, yeasty, bready/cakey, and yummy with chocolate bits and fruit. I've posted on the Martha Washington cake on Facebook, I'm pretty sure. I would not call it a fruitcake, frankly--it's more just a poundcake with fruits and nuts in it. The preparation for this cake was done by beating the egg whites and yolks separately. The whites are beaten until stiff, and then folded into the batter. However, this batter is pretty stiff all on its own, so I didn't get a good rise--I feel the batter flattened out a lot of the bubbles in the yolks. I also had soaked the fruit in alcohol, as mentioned in the recipe, but then also wrapped the cake in brandy-soaked cheesecloth. Uh-uh. Not enough heft in this cake to support the additional alcohol--it felt a bit too hot in the mouth. Once that alcohol evaporated, however, it tasted fine. I wouldn't bake it again, however, as I truly didn't feel it was a fruitcake. The other Nigella Lawson recipe, the Golden fruitcake, was a big hit. This cake is described by Nigella as "squidgy," and I agree. It is just oozing delicious, sticky fruit. Big thing with this cake--gluten free! No flour in the recipe. Certainly adds to the "squidginess" if there's no glutinous batter involved! I advise cutting this one in very thin slices, however, as it is quite rich. The chocolate and Lee fruitcakes were very similar in that they had a pretty even proportion of fruit to cake, and both were QUITE boozy--both are soaked in booze after baking. The chocolate fruitcake was very approachable--almost a quick bread with fruit in it. A good "fruitcake for beginners." Finally, the Pfeffernuesse. I was a little disappointed. They were fine as cookies go--a spicy gingerbread-type cookie dusted in powdered sugar. I made these because they actually had black pepper in the recipe, and I was expecting something deliciously spicy. They certainly looked cute. But I have another Pfeffernuesse recipe that I've made that I like much better--they are dipped in a lemon glaze instead of powdered sugar, and they taste, well, frankly, more fruitcake-ish. The Jane Parker I've reviewed elsewhere. It was tasty, but as usual, commercially made pales alongside good, homemade cake. 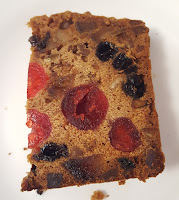 Hope you all are tucking into a delicious fruitcake of your choice as we edge toward the dark nights of winter. Happy Holidays, everyone!